Ammassalik is located in the territory of Tunu (East Greenland), on the coast of the Denmark Strait. Its municipality, which official name is "Ammassalik Kommunea", includes the villages of Kuummiut, Kulusuk, Tineteqilaaq, Sermiligaaq, Isertoq, Ikatteq and Qernertuarsuit. I copied the blazon from the seal at <www.ammassalik.gl>: it is a shield on a white field, with a white superior part and blue inferior part. 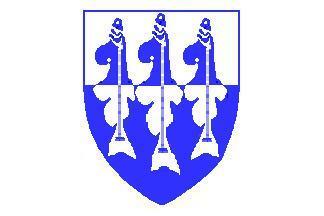 In the shield there are three fish, white and blue, placed vertically.